The Ebara seminar in Myanmar. Ebara Corp held pump technology seminars on 15–16 February 2018 at Myanmar Engineering Society (MES) in Yangon, Myanmar. Around 40 people attended the seminars from government agencies, local governments, and private-sector companies. Seminar participants showed strong interest in issues such as planning pump facilities for the water supply system, flood control and sewage improvement. 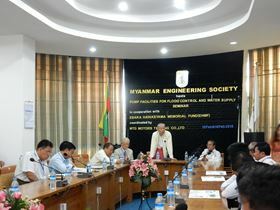 This was the 11th time that Ebara has held seminars in Myanmar in the last 24 years. Ebara established a branch in Yangon in November 2015. This year, Ebara is set to run five seminars in locations such as Vietnam and Thailand.